Discuss on the Tokunation Forums› Views: 9359 › Credit: Sungel on Rangerboard! 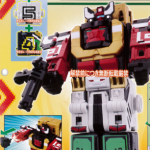 It’s been a busy 24 hours for the 40th anniversary sentai, behind the scenes images, blurry catalog reveals, and finally a decent look at the toys we’re about to come to know for the next year. While there are most assuredly more images still to come related to Jyuuouger, for now these are the abosolute best quality we’ve seen. We’ll keep you up to date as more images begin to circulate! Initial Jyuuoger Catalog Images: Suits & Cube Animals revealed! The wait is finally over, the leaks have begun! Doubutsu Sentai Jyuuouger is at last revealed! After a behind the scenes image was taken of the series Cube Animals on set yesterday we’re finally being treated to our first looks at this series toy catalog. 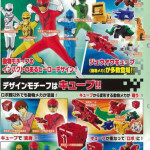 These new images provide us with our first look at the Jyuuougers themselves. Jyuuou Eagle, Jyuuou Shark, Jyuuou Lion, Jyuuou Elephant, & Jyuuou Tiger. Jyuuou Gorilla is absent for now. We also get our first peek at DX Jyuuou King! 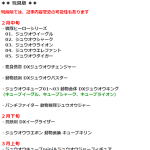 Composed of the first 3 Cube Animals (Eagle, Shark Lion) as revealed in toy information released late last week. Further images show us the basic cube forms of these 3 as well as reveal the animal forms of the first 7 Cube Animals including Cube Gorilla & Cube Giraffe. We’ll keep you up to date as closer to full size images and the eventual full catalog are made available. For now discuss what we have so far in the thread below! All images comes courtesy of @netabare778if on twitter.